Recently I needed to get my Jordanian visa renewed, and needed to travel outside the country to reset it rather than dealing with an overly complicated bureaucratic process. In order to rack up the least amount of expenses, I decided to journey across the Jordan River Crossing, also called the Sheikh Hussein Bridge in Northern Jordan. Northern Jordan is one of the most beautiful parts of an already beautiful country, and the drive was probably what I was looking forward to the most. Because my travel decisions were made at short notice, I was unable to book a tour bus ticket, which would have made everything much easier. Instead I was forced to do all of my travel “a la carte” and piecemeal it together as I went. The night before my travels, I called the bus station to make sure that they did in fact have an early morning bus to the Sheikh Hussein Bridge, not the King Hussein Bridge, which goes into the West Bank. After being told there was indeed a bus at 7am I set my alarm and went to sleep. Upon arriving at the bust station in the morning I found out that of course there was not a bus going my way, only to the King Hussein Bridge. I was then informed that it would be at least 35JOD for a taxi to drive me up to the border crossing, a huge jump up from a 7JOD bus ticket. On a whim, I got out my handy-dandy Uber app and lo and behold I could get up to the border for 25JOD! Now it must be pointed out that Uber is not strictly legal, so I was a little hesitant to make such a long trip using it. As I sat waiting for my diver, I got a cup of coffee from the stand outside the bus station. The taxi driver who told me my “friend” was crazy for driving me for 25 and kept trying to get me to let him take me for 35 insisted on acting as a go between for me and the coffee vendor. He proceeded to try and charge me 1 whole dinar for the coffee. Something about the look on my face made him instantly pretend he had just been joking the whole time and it was really half a dinar, which has sadly become the standard price for a cup of coffee nowadays. My driver arrived and we spent about an hour and a half driving through gorgeous scenery up and down, in and out of the mountains. There are so many little towns along the way that are very different from the bustling city of Amman. I reminded how high up Amman is as the pressure in my ears regulated as we approached sea level. The driver dropped me off on the road that leads to the Jordanian border, and I got into a taxi that takes you through the checkpoint to Passport Control. I had gotten there so early that I was the only person in the building who didn’t work there. The Security Officers were so very kind and helpful and I was quickly on my way. I didn’t want my travel to be restricted by getting an Israeli stamp in my passport, and the officers were very knowledgeable about how to ensure that I achieved this leaving and coming back. Then it was a short wait for a bus that takes you across the Jordan River to the Israeli side. Once the driver realized no one else was coming we boarded and went through a last checkpoint on the Jordanian side. On the Israeli side, I waited in the bus until we were cleared to head to passport control. Once there, it was a relatively smooth process having my bag and person checked and answering a few questions about my travel. I had printed out all my confirmations for this very reason. 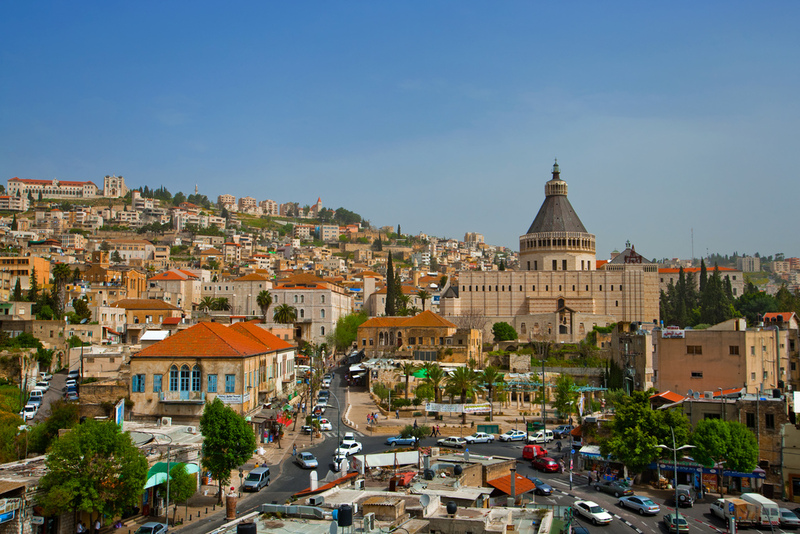 Unfortunately, because I was piecing my rides together as I went I had to get a taxi from the border to Nazareth, which ended up costing more than all my other travel and lodging expenses combined, a whopping 300 Shekels! There was no way around it though, as there are no buses heading out of the checkpoints unless you are on a tour bus that is connecting through. My taxi driver was nice and we made good conversation as he blazed through the countryside on our way Nazareth. Being just a few days before Christmas, the old city of Nazareth was alive with Christmas spirit. There were several field trips of students there to participate in the Christmas Market. I walked around the old city marveling at the numerous old churches and sat watching the droves of tourists who had descended upon the famous ancient city. The hostel I stayed at was in an old mansion and was incredibly beautiful. Because I had already been to Nazareth several times, after strolling around the Christmas market I spent the rest of the day reading in the many rooms of the hostel and turned in early. For the return trip I has booked a tour bus, and easy and uneventful as my trip there was, going by a reputable tour bus was even easier. Even the many stops and waiting times between checkpoints weren’t bothersome and gave ample opportunity to converse with other passengers. The return to Amman did take longer, though, because we stopped off in Irbid to drop some people off, which added about an hour to the trip. All in all, this was a great travel experience and I’m going to use it to renew my visa from now on. The beautiful scenery and ease of movement makes this an enticing short trip. Even if you are wanting to spend more time on either side of the border I suggest this route as it is relatively hassle free, and there are numerous tour buses that can get you to any destination on both sides.